When the second phase of Battersea Power Station was completed in the 1950s – giving the building its iconic four chimneys – the site around it on London’s South Bank was part of the capital’s industrial heartland. The power station is now being transformed into a modern commercial district – flanked by luxury apartments for the city’s thriving professional population. The whole of the surrounding area of Nine Elms, Vauxhall and Battersea appears to be in some state of redevelopment. High-end supermarkets built to serve future residents are, for the time being, occupied by construction workers, preferring orange PPE to a suit and tie. Behind Battersea Power Station, work is underway on the Northern line extension (NLE), which will link the new development to the Charing Cross branch of the Northern line at Kennington station. TfL received permission to proceed with NLE in 2013 and the initial preparatory works began two years later. A joint venture between Ferrovial Agroman and Laing O’Rourke (FLO) was appointed to deliver the project and tunnelling works began earlier this year. The £1.2 billion NLE project is the first addition to the Tube network since the Jubilee line extension and will be built mostly using private-sector money. The new line will pass beneath the Victoria line near Vauxhall and includes new stations at Nine Elms and the Battersea Power Station site. Once the tunnels are complete, the station fit-out will begin in 2019 and the railway will be ready for its first passengers in 2020. TfL has said the line will support 25,000 new jobs and the creation of 20,000 new homes. LONG DRIVE AHEAD Jonathan Cooper, a project manager for the extension’s tunnelling programme, said he remembered travelling into London when he was still at school and seeing engineers delivering London Underground’s last major extension project. Jonathan wouldn’t have imagined that 20 years later he’d be leading a similar scheme. He said good progress had been made since the first tunnel boring machine (TBM) began its drive in March from the Battersea Park shaft. Two TBMs, Helen and Amy, are being used to excavate the 3.2 km north and south-bound tunnels. Heading east from the shaft at Battersea, the TBMs are now slowly making their way towards Kennington, moving approximately 50 mm an hour and installing around 20 precast concrete tunnel rings a day. The north-bound tunnel is the most advanced, having made its way through around 450 metres of stubborn London clay so far. Further down the route, a team is excavating the station box at Nine Elms. 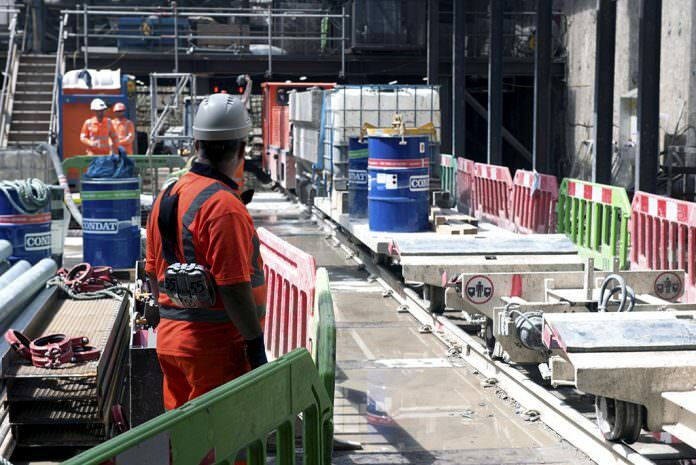 The ground conditions encountered by NLE’s tunnellers are similar to those Crossrail’s engineers confronted. The specification of the TBMs was actually based on those used to create Crossrail’s tunnels – albeit on a slightly smaller scale. 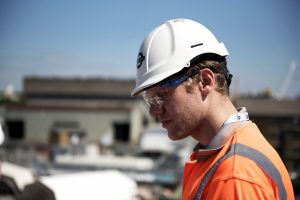 ‘One of the trickiest parts of the job is really dealing with unknown ground conditions and unforeseen obstructions in the path of the TBM, which we then have to get together with our contractor and agree an approach which makes sure we minimise the impact on programme and on cost,’ explained Jonathan. There have been some other challenges, including wells appearing where they shouldn’t be. ‘It was 10 metres away from where it was shown on the plans, so historic information is not always accurate.’ The TBMs will complete their drives in the autumn, but that won’t be the end of the tunnelling programme. Smaller mining equipment will be used during a closure of the Northern line at Christmas to connect the TBM tunnels with the Kennington loop. Jonathan explained how the NLE tunnels will actually be larger than the existing Northern line tunnels to accommodate a walkway, which would make it easier to evacuate passengers in an emergency. SUPPORT TEAM Just as critical as the cutting face at the front of the TBM is the conveyor system behind it that removes spoil from the site. A barge carrying 1,600 tonnes of material had just left Battersea for Essex, said Jonathan, where it will be turned into arable farmland. The excavated material is mixed with water and a foaming agent to make it more workable and it is then carried along a conveyor belt system through the tunnels and out of the shaft. ‘We also have all the support staff above ground which support the operation,’ said Jonathan. ‘Forklift drivers that move the segments around the yard. We have slingers and signallers which then enable the lifting of the segments down into the pit bottom onto the locos. We have the conveyor systems that take the muck out. ‘Without those, without all of these support systems, none of this tunnelling could actually take place.’ The excavated material is mixed with water and a foaming agent to make it more workable and it is then carried along a conveyor belt system through the tunnels and out of the shaft. ‘We also have all the support staff above ground which support the operation,’ said Jonathan. ‘Forklift drivers that move the segments around the yard. We have slingers and signallers which then enable the lifting of the segments down into the pit bottom onto the locos. We have the conveyor systems that take the muck out. ‘Without those, without all of these support systems, none of this tunnelling could actually take place.’ As well as the technical challenges of tunnelling beneath London’s surface, Jonathan has to juggle the needs and concerns of stakeholders along the route. These range from the developers that will build over the line once construction is completed and some of the area’s oldest residents. The tunnels will go 20 metres or so beyond the station at Battersea, taking the extension right up to the boundary of Battersea Dogs & Cats Home. ONCE-IN-A-GENERATION PROJECT Jonathan called the NLE a ‘once in a generation sort of project’ and an important one for maintaining tunnelling skills within the UK. ‘It’s been a small enough project that I’ve been able to get involved in a large number of areas,’ he said. The project runs 24 hours a day, seven days a week. At any one time, there is a team of around 45 people working on site. Jonathan, who joined the team in 2013 after moving from another part of TfL, is getting ready to take his young family on a summer holiday in the Alps. A well-earned break, you feel his colleagues would say. Written by Marc Johnson The post Inside the Northern line extension appeared first on RailStaff.